This fine silver jump ring's outside diameter measures 6.5mm (.251") with a hole size of 3.19mm (.125") and an overall height of 11.7mm (.461"). 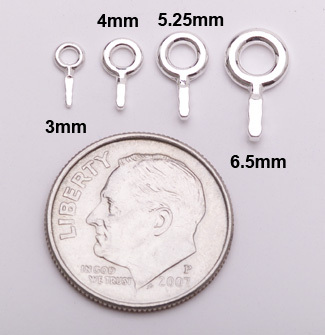 Use them when you need to add rings to your creations for earrings, bracelets and necklaces. Also can be used as a small bail for pendants. Featuring an offset tab with indentations to provide excellent bond to the metal clay, while giving you the ability to position the ring flush with the back surface of your work.